Del here. Again. Did you read the previous post where I totally wrecked the AG store in Dallas, Texas? You better have. If not, you better read it. 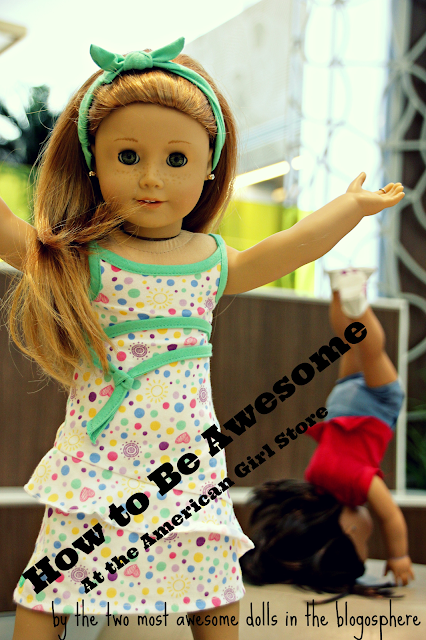 Not long after wrecking the AG store with Madi’s BFFs’ dolls and with Chloe from My Hobbit Hole, the terror and demolition of my wonderful self decided to head on over back home in order to wreck the American Girl store in Orlando, Florida. My awesome friend Mia posted about wrecking the AG store Orlando with me at this link. Madison was dumb and didn’t bring a decent camera, but I shouldn’t have expected any more from her lame, awful self. Everyone knows the only reason she has followers on this blog is me, anyway. And maybe a little because of Taryn. My little sis is cool. She also came with me. That’s okay. I’m so awesome, my epicness radiates even through her stinky iPhone photography. Madison, Madison. What is it with these filters? Your phone’s photos were so bad you tried to salvage them by making us look like zombies? But the minute Madison opened her mouth and tried to talk, it became agony. Did I mention she has nothing worth saying? She would’ve made the entire trip miserable just by her presence had my sister and I not been awesome. When we arrived at the Orlando AG store, we met Light4theLord and Mia, Elizabeth, and Madi from Dolls N’ All. Nope. No pictures of Light4theLord. Sorry. Her awesomeness is uncontainable. Your computer or mobile device screens wouldn’t be able to handle it. They’d blow up or burst into flames or something. LOOK AT ALL THESE AWESOME PRESENTS. Well, okay, in the picture you see just one. It’s for Taryn and I. Madison will do a birthday post soon (ha. ha. ha. Yeah right, Madison. “Soon”. Suuuure) and since they were partly birthday gifts you’ll get to see them then. Oh? What’s this? Madison would like to give a message to Light4theLord and her family thanking them for their awesomeness and the epic gifts? You know what, too bad. No, Madison. You don’t get to be in my post. Thanks, but no. I’m going to go run with the laptop now and YOU CAN’T CATCH ME. FIRST WRECKAGE STOP: THE GRAND HOTEL. It was a beautiful time of Del demolition and destruction. Mmmhmm. Yep. Bring on the condiments, and the food, and more food. Keep at it until you die, and even then keep on going as a ghost. Don’t disturb me. I’m napping. FOOD?! Dude! Why didn’t you disturb me?! ^ The condiments I kept ordering and ordering JUST TO ANNOY THEM. I was not that interested. I did not say hi. At first glance, Mia was not half as awesome as me. I radiate awesomeness. What do you think? Would busting these windows cost enough money to make Madison’s debit card suffer? Which, by the way, I still have from wrecking a hotel. That reminds me — I still have to do a post on that. The pictures are priceless. THAT WILL COST MADISON A PRETTY PENNY. NEXT WRECKAGE STOP: TENNEY’S BABY BANDSTAND. After watching Mia wreck the grand hotel, I began to realize HER AWESOMENESS. Blown away, I’ll tell you. So we joined awesome forces and wrecked Logan the Lame’s and Little Miss Taylor Swift’s baby bandstand. Steal the show. Then drop the mic. Mia was great at shaking the tambourine and getting the entire song off beat. IT DROVE THEM BESERK. Dude look at Elly back there ?? Amazing. NEXT WRECKAGE STOP: GABRIELA’S DUMMY DANCE STUDIO. Mia did it right. Breaking the barre, stealing the stuff — DESTRUCTION. Me? Just as right. Taking away Gabby’s dance essentials. LAST STOP: Z’S GENERAL LAMENESS. I hopped on her scooter, pushed her helmet down over her eyes, and ran over her toes. DEMOLITION OF THE FOOD COURT. Oh, it was spectacular. Elly, Madi, Mia, Taryn and I had a BLAST. Until then, keep commenting revenge ideas I can do on Madison, if you have anymore. I know I’m definitely going to be hitching a ride with her to the store soon (bringing my phone along to take pictures >:D) to buy whipped cream — just guess all the grand fun I’m going to have with THAT. ? If you haven’t witnessed Mia’s awesomeness over here at her account of the demoliton, you were bad and disobeyed me because I told you to read it before this. So go read it. Now. Now comment and tell me which stop of ours we destroyed that you liked best. You’ll get a chance to be randomly shouted out in my next post. You know, because I’m awesome like that. P.S. Like, too, so I can deem you cool. P.P.S. Because if you just like and not comment, you’re lame. P.P.P.S And if you comment but not like even though you have a WordPress account, that’s just weird. P.P.P.P.S. So do both and be cool. Delaney: Poor them nothing! Their lameness deserved to be wrecked. And good. Good for you laughing at them. They looked so weak, helpless, and confused when you wrecked their performance! You are so amusing sometimes, Del! My favorite was you utterly destroying, Tenney’s stage. It was fantabulous. Delaney: Yes. Thank you. It was. DELANEY! You’re awesome! It was SO much fun. And I love your names for those terribly horrific displays for OUR AWESOMENESS! Hey, I’m insulted. You didn’t know I was awesome before I wrecked it with your HELP?! Delaney YES I KNOW. IT WAS! Heh heh. I loved yours too. And yes. I didn’t realize your awesomeness at first. BUT NOW I DO. And that’s what counts. I think. *sighs in exasperation* *decides to just roll with it* what you did to logan and tenney was funny though. XD except that I wouldn’t be able to stand the noise either…. Delaney: Yep. IT WAS. XD Mia was epic. The word COOL, doesn’t begin to contain the major amazingness contained in Del. Taryn is, just… SOOOOOO cute. AND (LAST THING)… HEY MADI! YOUR SO IMAGINATIVE! KEEP UP THE GREAT WORK. (-; (I GOT TO STOP TYPING IN ALL CAPS, LOL.) Bye! P.S. Oh, that’s awesome! Madison is already subscribed to your blog. I really like it. It’s awesome. P.P.S. Yep. Awwww yeahhh. ??? P.P.P.S. My sister is pretty cute. Ooh, I had an idea. What if you said, DELmolition and DELstruction. I think its cool. My favorite stop was the hotel. I think it was cool. Paige here. I think you should put whipped cream in Madison’s hand while she’s sleeping. Then tickle her nose. It’s a classic! Delaney: Thank you, thank you. HAHA. I like that. BEAUTIFUL. Also, it was. Mia and I really liked doing that. Poor AG Store! We did get a few laughs, though. It was cool when Del and Mia teamed up. Poor AG store indeed! LOL! They had a lot of fun. 😀 Thanks for commenting! HAHA. I am loving you, Del. This post made my day (night?) Your sass is just amazing. I would have paid to watch you trash that store. YOU SHOW LOGAN AND TENNEY WHO’S BOSS, GIRL. Delaney: Awww yeahhh. ??? Actually, you do have to pay. For even reading the post. Fifty bucks, please. Just kidding. YES. LOGAN? TENNEY? YOU’RE GOING DOWNNN. Oh, and I hope u didn’t mess up Tenney’s (horrible little dreadlocks) perfect curls. She would have been DEVASTATED! XD Mia looks SICK?. (I mean, cool, sick, like – oh, y’know whadda mean) EEEEEEEEEEEEEEEEEEEEEEEEEEEEK!!!!!!!!!!!!!!!!!! YOU ARE KIDDING!!!!!!! NO WAY DID U GET TO MEET L4TL!!!!!!! What’s she like? I bet she’s, like, SOOOOOO TOTALLY NICE, amirite? ????? ?And sick hair. And ooooooooooooooooohhhhhhhhhhh!!!!!!!!!!!!!!!!!! ?????? ?YOU GOT TO MEET L4TL!!!!!!!??????? I LITERALLY CANNOT BELIEVE IT!!!!!! ?????? ?XD Excuse my fangirling XD And O.M.G. I wish I could meet L4TL!!!!?????? And OOO.MMMM.GGGGG. I SOOOOOO TOTALLY wish I could meet you EVEN MORE!!!!!!!! ?????? ?XD Sorrrrrryyyyy! Delaney: Good. DIE. DIE OF MY AWESOMENESS. ??? HAHA YES. It was beautiful. ??? THANKS FOR COMMENTING. YOU ARE COOL. YESSS!!! LOL XDD L4TL is EPIC. Awwww maybe one day! Oh, if I ever travel to New Zealand I will let you know. ? I liked the destruction of the Grand Hotel (though it’d probably not so grand anymore! XD) and when you rolled over Z’s toes with her scooter. Awesomeness. ? Delaney: HAHA YOU’RE RIGHT. Not so grand anymore! XD And yes. Awesome. ? Hahaha, Delaney is so sassy. I really enjoy reading her posts! Hmm, sorry Delaney, I don’t have any ideas for annoying Madison at this moment. Heehee..
Delaney: GOOD. GOOD FOR YOU, SARA. GOOD. And BAD SARA, BAD! I need ideas for annoying Madison! But good for you for commenting. YOU ARE NOT LAME. Delaney: YES. A VERY BIG HANDFUL. MWAHAHA! And it was great! Ooh, very good. Thanks for liking and commenting, Very Cool Livy. I CAN’T EITHER. IT WIL BE GREAT. AND HEHEHE MAYBE. Looks like everyone had a great time partying at the store! Hehe, they did! Thanks for commenting! Nora: DEL. THAT wreckage of the stage was probably THE BEST THING. LIKE EVER. EVER. Give Termagant Tenney a beating for me next time you’re at a store. My friend Gabby, who was at that store, whose dance stuff you stole, says that you were cool except for when you screamed like a baby when you were dangling off the edge of the display like Mufasa when she caught up to you and you tripped. And I live at that store, btw. I saw that, but Gabby’s description was funnier. ??????? I can see EVERYTHING from the back of the store. ?? The people who work at the grand hotel are total snobs. They deserved what you did to them. Z is… interesting. When she saw her cheap plastic overpriced collection, she lost faith in AG and is forming a plan to trash the store at night. Since I’m the only doll with access to a computer, she told me to tell you that you’re welcome to join in. Delaney: Yep. Yep it is. Never believe Gabby… she has a wild imagination. I do NOT scream like a baby. Mph. Hm. Z’s plan sounds cool. Mine is cooler. Nora: Mm. well remember how I saw you dangling over the edge and screaming? Because I live in the back? I’m just stuck under a jumble of furniture, on a desk, where there’s a laptop. Delaney: Mm… nope. Don’t remember that.